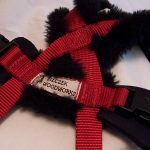 This tracking and road work harness is adjustable within the range of sizes shown below. 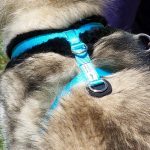 Harness neck should be adjusted so the shoulder pad fits firmly at the base of the dog’s neck while the padded D-ring is on the dog’s breastbone. 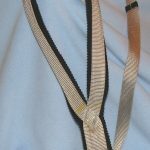 The cinch may be adjusted forward or back by sliding through the bottom center strap. Once adjusted, the harness will stay in this position until changed. Side release snaps on both sides of the cinch make it slip on easily. Neoprene padding under the d-rings, side release snaps, and adjustment buckles on the shoulders to protect the dog. Neoprene padding continues 6″ up neck and on strap between legs. SKU: ATEP. 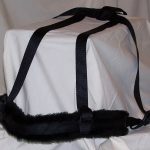 Categories: Harness-Adjustable, Harnesses.